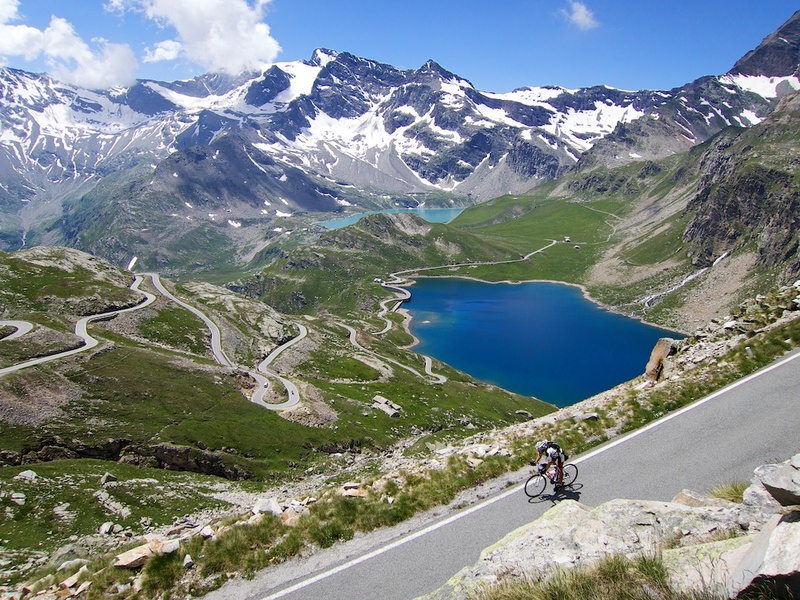 Colle del Nivolet is a gigantic climb in Piemonte, Italy in the heart of the Parco Nazionale Gran Paradiso. It was built between 1953 and 1963 to service the two hydroelectric dams up high. The national park, along with the Vanoise National Park, (the connected French side of the highest mountains here), make up one of the largest protected natural areas in Europe. Apparently the wild ibix here migrate between the two parks. Wikipedia lists it as the 8th highest paved road in Europe at 2641 metres (the summit sign say 2612m). I started in Locana forty kilometres from the summit. In fact, the climb takes quite a while to get interesting. The first half is on a lightly trafficked, but main road that gently climbs towards high mountains. Nothing too special. TIP: After 14 kms there is a 3.5 kilometre uphill tunnel (8% average). Not fun at all. To bypass: a 100 metres before tunnel take the small road on left. It is the old road — in terrible condition, but hey (and there are some great old hairpins). After 2 kms you are forced into the tunnel. But ride 100 metres inside and climb out again on the left onto a better quality old road that rejoins the main route at the tunnel exit. Phew! 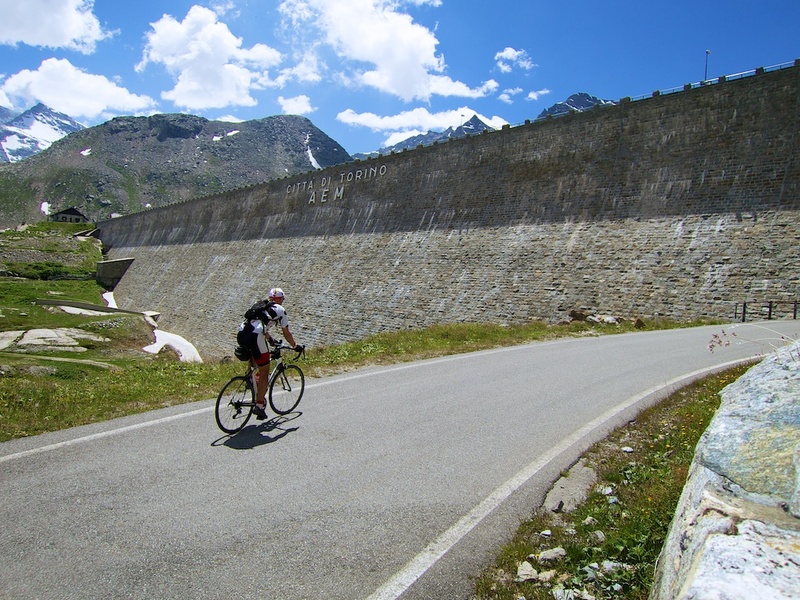 The route gets more touristy as it reaches Lago di Ceresole – a large artificial lake with a dam. It’s after the lake that the climb finally starts to get fun. From 15 kms or so to go, the road is closed for 7 months of the year a clear sign that we are leaving civilisation. The steepest part of the climb are these great hairpins below the two dams. They wind everywhere, I failed to capture a good photo, but fun to cycle. The first diga (dam) is the big one. Diga/Lago di Serrù. 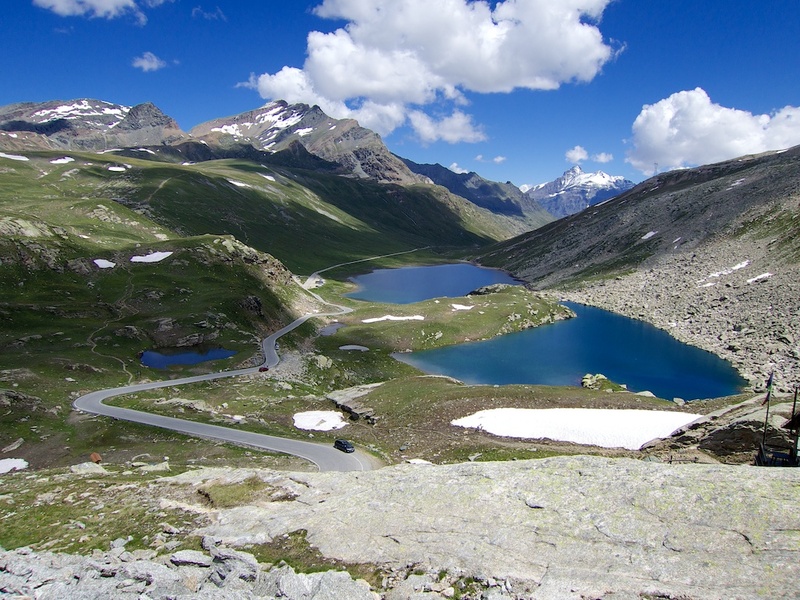 The beautifully coloured Lago di Serrù decorates the view for the spectacular last several kilometres to the summit. Every Sunday until the end of August, the road from Lagi di Serrù until the summit is closed to motorised traffic. Bikes/pedestrians only. Next, there is a much smaller dam at the darker blue Lago Agnel. A flat stretch, but scenic. Then the road heads up again. After the Colle (pass), the paved road descends for a couple of kilometres. There are a couple of more lakes and a little restaurant – it’s just over the Piemonte / Aosta border. 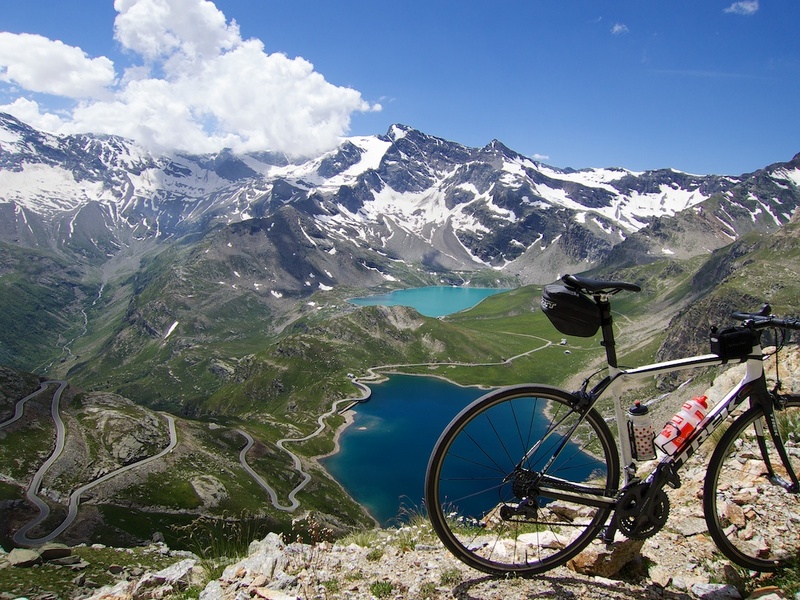 By mountain bike it is possible to continue down into the Aosta valley via Valtourmench. I loved, loved, loved this climb. And I had a lot of fun trying to get a few photos on the way back down. Near the start of the climb to Nivolet is a fabulous “secret” road to another high alpine dam. Lago di Teleccio. Highly recommended, and perhaps the only other “great” climb in the region. See here. Trust me, truly marvelous. The film The Italian Job features this climb, a point of interest worth noting, at the end the coach comes to rest precariously high above those lakes. Hi Ian, thanks for that. 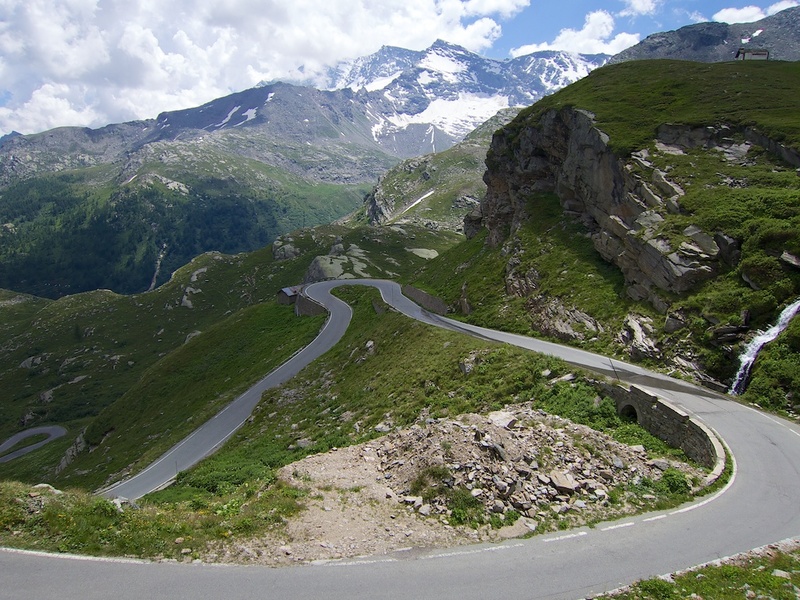 Pingback: Here are my ten favourite alpine Road Bike Climbs of 2014. Last year the road above the dams opened in late June. It is situated in the Parco Nazionale Gran Paradiso . So I followed the news on their official site. I also contacted them in mid-June and they quickly responded with the planned dates for opening more than a week before it happened. Hi Will. Did this one last week with my daughter and I fully agree with you. 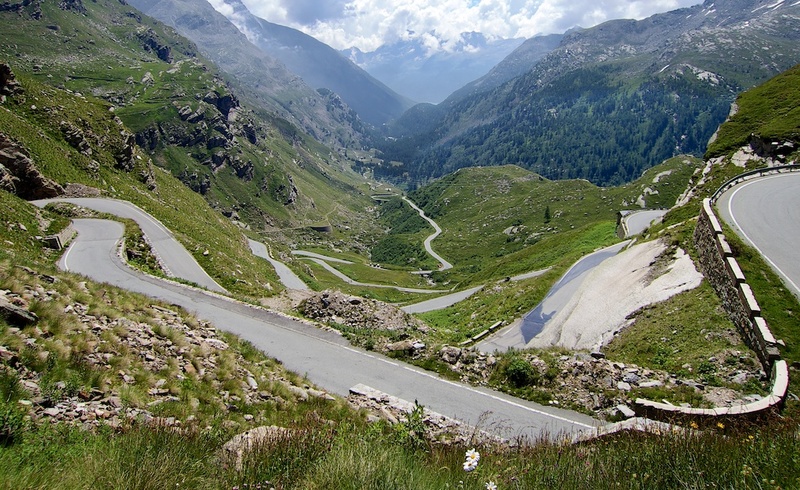 This climb has everything except traffic and it’s easily as breathtakingly beautiful as Stelvio! We did however start at the beginning of ‘Lago di Ceresole’ to avoid the less interesting bit (and the scary tunnel). From here it only gets better and better… If I could choose only one climb ever I think I’d choose this one. Thanks for the inspiration! Fantastic, well done. I think you were wise to start where you did. Fantastic col and even better pictures. One question: how do you take your own pictures? Auto timer doesn’t give enough time to get down from such a beautiful vantage point and ride the bike before the pux is snapped. Will try to do this col next year. Gavia and Mortirolo + Dolomites this year. 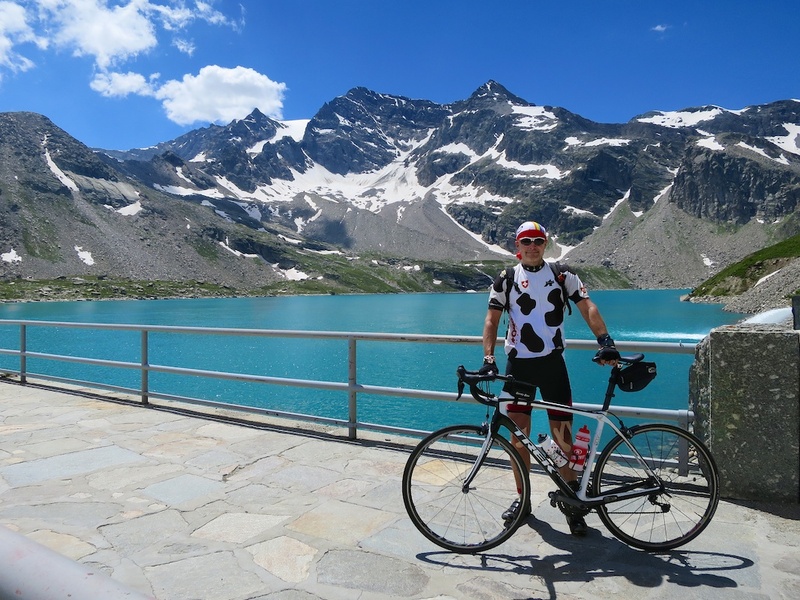 Did the ride one week ago (after lago del narret and passo della novana the day before). Was already very cold at the top, but what a stunning climb! One quick comment on your tip to avoid the tunnel: the small road to avoid the tunnel is on the left, not on the right. Thanks for spending the time building this top list of 100 favorite climbs, you are the best! I tried to go to the right, but had the impression the road was just going up. Then I went back and took the road which leaves on the left of the main road , and passes along the river all along. Maybe if I would have kept on the right I would have been able to pass above the tunnel and reach back the same road (from the map seems that both left and right road joins after 250meters). I did the climb yersterday, based on the info here to take the right turn, we went 2km uphill at 18% to a dead end road. We went down and took the road to the left and ended up a what seemed also a dead end road blocked by a huge rock , we went back again and found no other road so went back again to the road with the rock and had a look behind the rock and there was the road that went past the tunnel. About halfway you enter the tunnel again and the after 100m or so you can exit the tunnel again climb over a wall and get to the second part of the road. The wall to climb over is almost a 1m high you have to look out not to damage your bike. Tim, glad you found it – sorry if I didn’t explain it well – for others have a super close look at the map in post as it may look closed as you search for it. Yes, it was a little complicated, and requires going back in and quickly out of the tunnel part way up. After a very long time of anticipation, I finally managed to ride the Colle del Nivolet today. You couldn’t be more right, this is cycling’s greatest road climb. I started from Locana too, I wanted to make sure I got the ‘full experience’. Forty kilometers of pure enjoyment. The very tough headwind and freezing rain in the kilometers before the dam, who cleared after this point, added to the experience. Thanks for sharing this gem with us. Fantastic, congratulations. A shame about the rain, but very well done. Your site is a real inspiration for me, in my search for scenic and hidden climbs. From 14 of 15 august I ‘m going to Italy for a week and bring my race and mountainbike. At this moment I have booked a hotel close to Colle Fauniera. For the other part off my holiday I’ m in doubt off chosing for colle Nivolet or colle del Assiette. If I do colle nivolet, which I prefer, I m staying in Pont Cavanese or Locarna. Do you know if there are any nice cols to climb (race or mtb) in that area. You mean Locana? 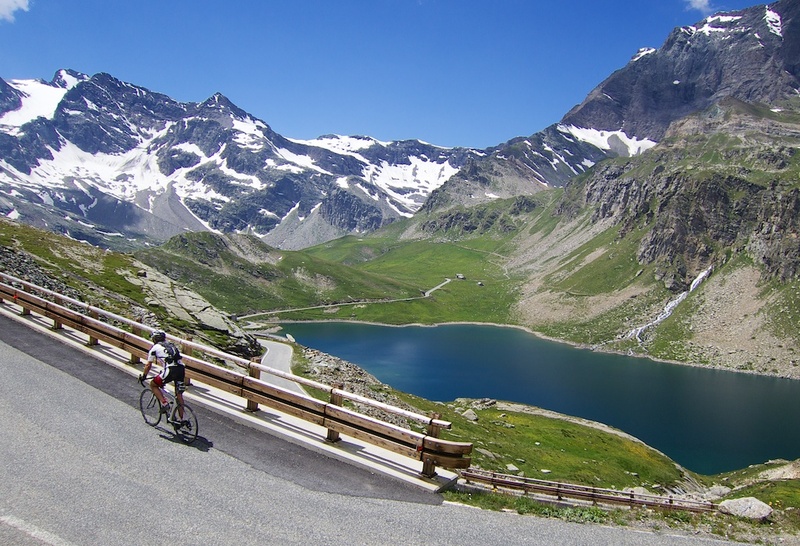 The one big climb near Nivolet that is on my list ….. but I’ve never done is Lago di Teleccio. It starts on the way up to Nivolet, from the tunnel. It looks very steep, certainly quiet, but I don’t know the surface quality. Some details here: http://www.cyclingcols.com/col/LagoDiTeleccio There are lots of huge climbs near Strada dell’Assietta – the best are all gravel/mountain bike. Search my blog for Jafferau, Chaberton, Colle delle Finestre, Colle del Sommeiller for some ideas. These are some of the very highest unpaved roads in the entire Alps. Fantastic stuff. On the other hand, Nivolet is perhaps my favourite road climb. You’ve picked a good area. Hope that helps. Hello Will, I ve done several climbs in my life but never had a real favorite. Until now! Colle de Nivolet is the best ever. I did it on monday after driving through the night because the weather forcast for monday was the most promising. I started at Sparone. So it was 43 km and 2000 meters of climbing. The fun started just before the tunnel with the steep hairpins, then the old scenic road. It was easy to find, Your tip and following the tracks of the bikes in the gravel. Being tired it was very hard to reach the top. It took me more then 4 hours. But you get so rewarded with the nice views. It is as if Colle the Nivolet has the best parts of every climb I ve ever done. On tuesday I tried to go to Lago Tellecio on my mtb, and the plan was to bike or hike on left side of the lake to refugI. Pontesi. It is steep but the surface was better then I expected. After San Lorenzo you reach an upper valley where it is less steep. After the last abandoned village, there is a massive wall, with some hairpins. You only hear the sounds off nature and heavy breathing. Unfortunate the sound off nature became thunder so I had to turn 2 km before the summit. today I did Nivolet again, from the exit of the tunnel. And I must say, it is more enjoyable and less struggling. After the descent I tried to go up to Lago telluccio again but on my roadbike. Although the sky had been blue the entire day it started to rain at San Lorenzo. I waited for an hour but the conditions became worse. After some thunder I decided it was best to descent and save some energy for colle Fauniera the next days. The climb to Lago de Tellecio can be done on a road bike it even has some stretches with new asfalt. Going down is slow, but not to bad even in the rain. Peter, Thanks for the report. Well done. I hope to climb Tellecio soon. Alex, fantastic ….. thanks for sharing! Very nice photos! Yes, it is possible to cycle first two km or so along wide gravel road, next below in valley is narrow trail sometime rideble (carefull) sometime walking – some places are very wet (torfmoor). Last 1,5 km is typical hiking path – narrow twisty and steep. You must take bike on shoulder. Just below this steep section is nice waterfall. Finally you find park place and asphalt road. Nice adventure although road from Ceresole Reale is more impressive. Thanks guys! The description of Zbynek is very accurate, nice! I road it today in bad weather. Still an Amazing climb even if I didn’t actually seen half of what you amazing pictures shows coz of the fog. But I was still there and your site was one of the inspiration to do it. Thanks. Amazing, Probably I will go for it next year. Meanwhile will make myself physically fit. One question, how much time does the whole journey take if we start from Locana? I did a smiliar trip in India, 100 kms a day with 20% incline and flat roads, it also includes 2 hours lunch break. Is it advisable to stay at Locana? I would be coming from Piacenza, so can I rent any bikes there? Tough to answer, it depends how strong you are. It’s 2000 metres climb from Locano. Hard work. 3 hours perhaps for me. 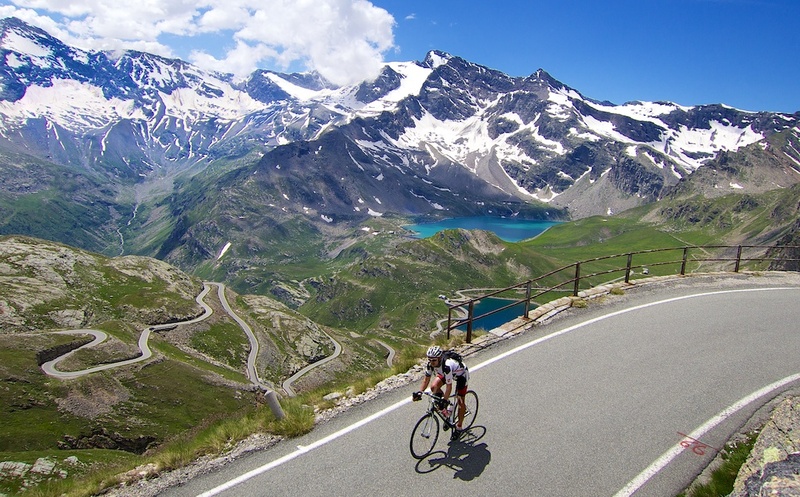 I hope to be heading to Aosta Valley next summer. Saw Mike Cottey’s video on Colle del Nivolet below and then a google search got me to your site. Guess I should have started there. You had very positive write up on the ride. But I am staying in Aosta. So am on wrong side. I don’t see any roads on north side of Nicole? But there is a Colle so I thought there would be? So given your recommendation on the ride, am thinking of reducing accommodation time in Aosta and spending a couple of nights near Local as I don’t want to drive all the way around to Locana and then back to Aosta in a day. Is there a climb on north side? I suspect not. If not would you recommend anywhere to stay? I then plan to drive to La touissure. John, reaching Nivolet from the Aosta side of Nivolet requires some hiking (see a couple of comment from others above). I tried a few years ago. It’s a 26 km road climb to Pont, then some steep, unrideable hiking, for a few kms until a road is reached …. initially unpaved. I ran out of light when I tried and double backed: see here: https://www.cycling-challenge.com/valsavarenche/. But it’s not really a road bike idea. I have a map with Aosta rides that I have done – https://www.cycling-challenge.com/vallee-daoste-cycling-map/. There are quite a few good rides. The town of Aosta is nice enough to stay. Or I like a hotel near Bard, below the big castles at a choke point in the main valley. 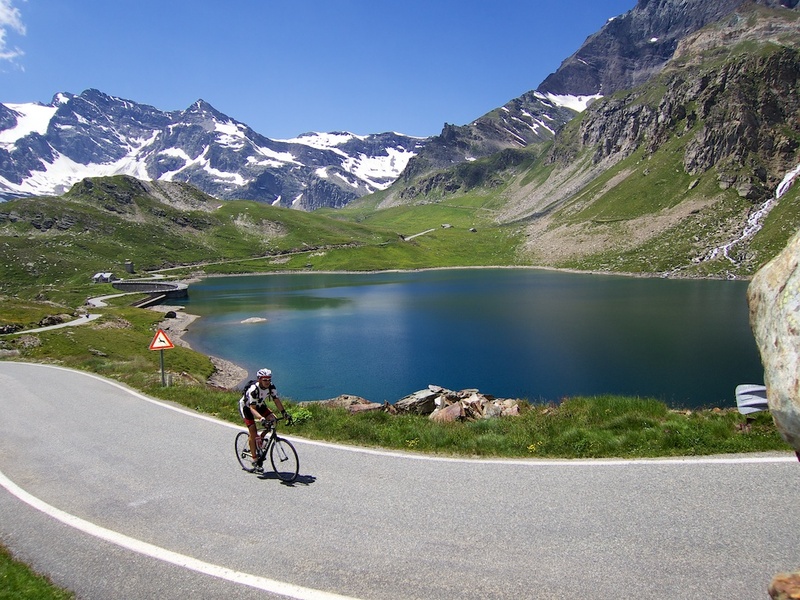 There is one other great climb that starts on the same road as Nivolet far lower down: https://www.cycling-challenge.com/lago-di-teleccio/ It’s tricky to know where to stay. Ceresole Reale on the big lake perhaps 20 kms from summit of Nivolet is sort of a resort region with several hotels, it is above much of the climb, but well below all the superb parts. I have stayed a couple of times in Rivarolo Canavese and then driven to the start point. It’s an OK town (nothing too special though). Finally, make sure you read closely my tip on how to take the old road that skips the 3 km tunnel. It makes the lower part of nivolet far more fun. Thanks will. Very useful. My wife is a hiker, usually when I am on a long ride so maybe she will join me on the walking section. I will check out the towns you mention. I tentatively booked something in Locana but not sure if it’s up to my wife’s standard. By the way, the aosta tourist office have a fantastic hard copy folder with about 30 rides in aosta Valley. I will do some more research and may bother you again with some more questions. yes, I have a folder with all their route cards. It’s nicely done. Just a quick question – is it allowed for cyclists to go through the aforementioned tunnel? Thanks. Yes, bikes are allowed in the tunnel. Thanks for the quick reply. But to my understanding, the tunnel is not lit (and considering it’s very long, perhaps the ventilation is not best either)? I’m trying to plan a multi-day round-trip and your website is of huge help. I think I’ve already sent you my compliments last year but can’t praise it enough :-D.
Another great post Will – thanks! We’ll be in the area around early/mid-October – do you think it would be open/passable that late in the season? As Will says, it’s a lottery, but I was up there on Oct 26 2017, in sunny weather, 14 dec C at the top. The road was closed to traffic above Ceresole Reale for the season, so no cars. The larches had turned beautiful yellow-orange, I want to say “ablaze”, unfortunately literally so down in the valley where they had some bad forest fires (back in Ceresole one couldn’t see 10m for the smoke). Note that the old road that bypasses the tunnel above Noasca has been resurfaced in preparation for the Giro this year (they ride up to the dam, not the col).